This versatile and stylish messager bag is a great gift for birthday, anniversary, valentine's day, Father's Day, Thanksgiving, Christmas, New Year or another significant event. Fit in business office or party. 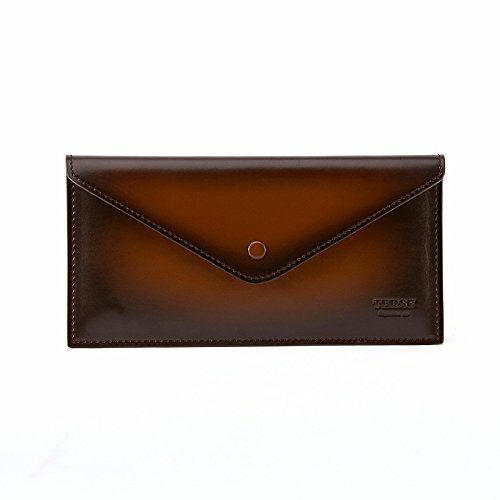 TERSE: TERSE focus on handmade art since 1979, dedicating in providing customers with high-quality leather products and pleasant user experience. We specialized mainly on men & women's leather wallets, passport wallet, credit card holder, handbags, shoulder bag, clutch bags, backpacks etc. EXCELLENT QUALITY: All TERSE products are made of Italian exceptional calfskin which is selected from high-quality milk cow as raw material. Combined with the unique ancient art of manual coloring and brush-off tech, follow TERSE, enjoy better taste! STRUCTURE: Product size is 22.5x11.5x1CM, net weight is about 0.11kg. BEST GIFT: Packed in a beautiful box with gift bag and gift card as well as a warranty card. Vintage style wallets for men with unique textile is the best gifts accessories for men&women. This versatile and stylish wallet is a great present for birthday, anniversary, valentine's day, Father's Day, Christmas, New Year or other significant holiday. UNIQUE ENGRAVING: TERSE Logo embossing. All TERSE leather products can be customized according to your favor, enjoy your unique belongs! Please be patient and note that customized products will take few time to finish and ship from China, anymore information please feel free to contact us.